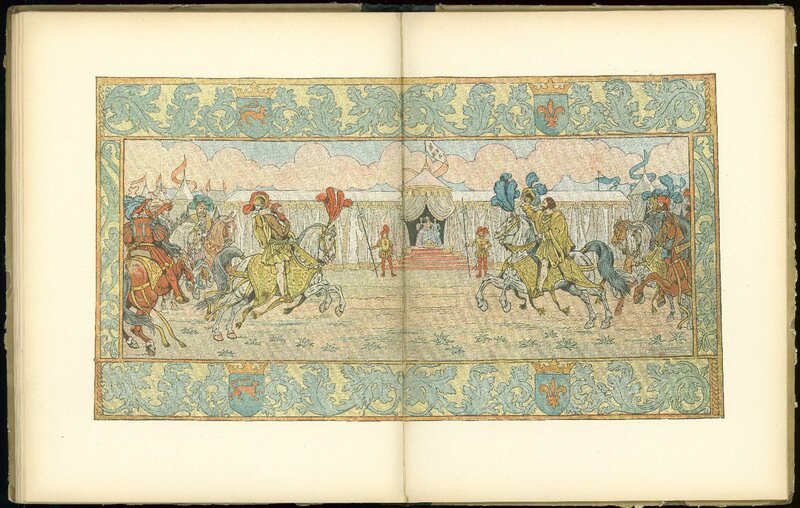 Color print of two page spread 2/3rds through France: son histoire. Detailed examination of the original indicates it to be a relief print. The printing/reproduction method of this example is possibly a chromotypograph or color line block. References to this book have also indicated a date of circa 1910. Illustrated by Onfroy de Bre´ville, Jacques Marie Gaston, 1858-1931. From the WMU Historical Children's Collection. Montorgueil, G. (Georges), 1857-1933. France: son histoire. Paris: Boivin [1917? ].